Blue sky, the sun is shining and the temperature is up. What better place to be than on the beach! For the June round of The Arcade I have a snuggly place on the beach for you and your sweetheart or to hang out with your friends or just enjoy the summer by yourself. 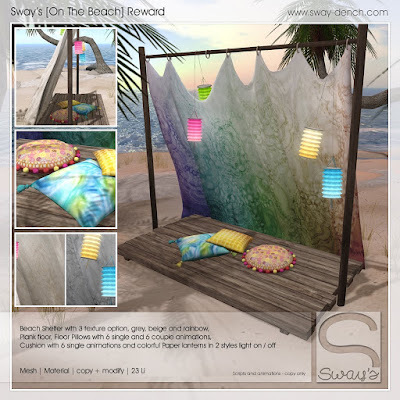 The 25 plays Reward, is this awesome Beach Shelter. It fits perfectly to the Gacha. Exclusive and only available at the Arcade from June 1st - 30th. 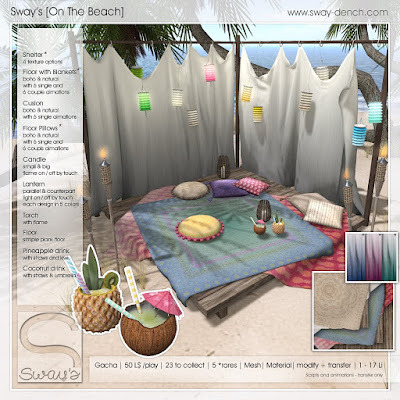 Beach Shelter with 3 texture options, grey, beige and rainbow.